The badge earner has an understanding of the concepts of DevOps and the value that this approach can bring to organizations. 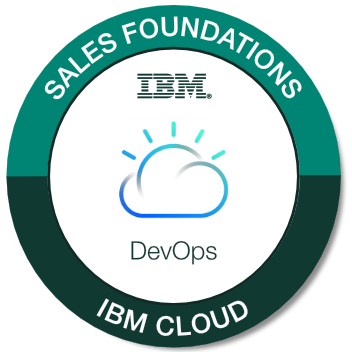 The badge earner has knowledge of the IBM Cloud offerings to automate and integrate the key phases of a DevOps lifecycle and can recommend solutions to address specific client needs. This badge is only available for IBM Business Partner employees. Pass the DevOps Sales Foundations Test with a score of 80% or higher. Optional: Complete the DevOps Sales Foundations Learning Roadmap.